Home / CELEBRITY NEWS / Scarlett Johansson Tempts as Python, Kaa in "The Jungle Book"
Scarlett Johansson Tempts as Python, Kaa in "The Jungle Book"
With only her voice, Scarlett Johansson made people madly fall in love with their computer's operating system in the futuristic drama “Her.” Now, Johansson once again uses her voice to capture hearts in Disney's new family adventure “The Jungle Book,” based on Rudyard Kipling’s timeless stories and inspired by Disney’s classic animated film. Johansson provides the voice of Kaa sets her sights on Mowgli when she discovers him all alone in the jungle. 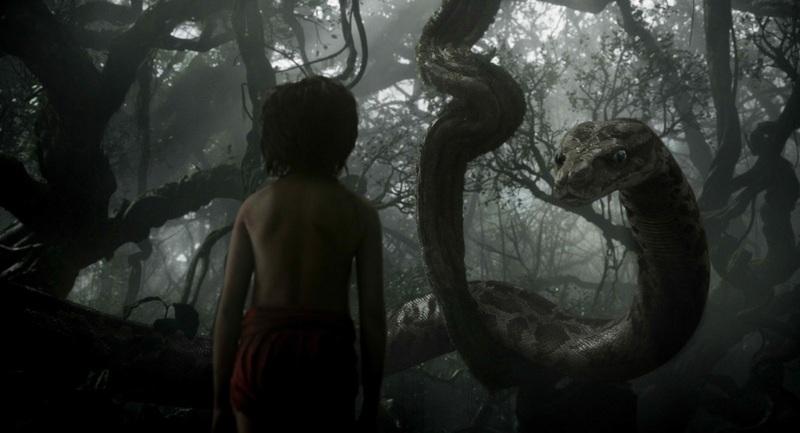 The massive python uses her seductive voice and hypnotic gaze to entrance the man-cub, and Mowgli finds himself unable to resist her captivating embrace. The director says one of his most prominent memories of the 1967 animated movie was the snake. “I always remembered Kaa’s hypnotic eyes with the spinning pinwheels,” he says. Though Favreau wanted to maintain the spirit of the character, he decided to change its gender. “All the roles were male in the 1967 version, so I thought that there was an opportunity with Kaa to mix things up a little bit,” says Favreau, who called on Johansson to help bring the seductive snake to life. Says Johansson, “Ever since I was really young, I've loved doing voice work. Actors have different tools—our physical selves, our voices. When you take one of those away you become hyperaware of all kinds of tendencies. It’s an interesting process and sometimes you get these happy accidents and ornaments that decorate the performance. It’s an exciting way to work and dig deeper. The character is designed to be intimidating, yet believable. “I saw a bit of Kaa early on during the production,” says Johansson. “It was important for me to see how she looks in proportion to Mowgli to help inform the presence and intensity of my voice. I had one tool—my voice—so it would’ve been very difficult without some sort of pre-visual reference. Johansson has vivid memories of the 1967 version of “The Jungle Book.” “I remember that soundtrack well—it was so popular when I was a kid. ‘Bare Necessities’ was on constant repeat for every kid my age. And the idea of this jungle kid being raised by animals was just fantastic. “The Jungle Book” is an all-new, live-action epic adventure about Mowgli (Neel Sethi), a man-cub raised by a family of wolves. But Mowgli finds he is no longer welcome in the jungle when fearsome tiger Shere Khan (Idris Elba), who bears the scars of Man, promises to eliminate what he sees as a threat. Urged to abandon the only home he’s ever known, Mowgli embarks on a captivating journey of self-discovery, guided by panther-turned-stern mentor Bagheera (Ben Kingsley), and the free-spirited bear Baloo (Bill Murray). Along the way, Mowgli encounters jungle creatures who don’t exactly have his best interests at heart, including Kaa (Scarlett Johansson), a python whose seductive voice and gaze hypnotizes the man-cub, and the smooth-talking King Louie (Christopher Walken), who tries to coerce Mowgli into giving up the secret to the elusive and deadly red flower: fire. The wild adventure swings into Philippine theaters in 3D on Thursday, April 07. “The Jungle Book” is distributed by Walt Disney Studios Motion Pictures through Columbia Pictures. Follow the official social media accounts of Disney in the Philippines, namely, (FB) WaltDisneyStudiosPH, (Twitter) @disneystudiosph and (Instagram) @waltdisneystudiosph and use the hashtag #JungleBookPH.